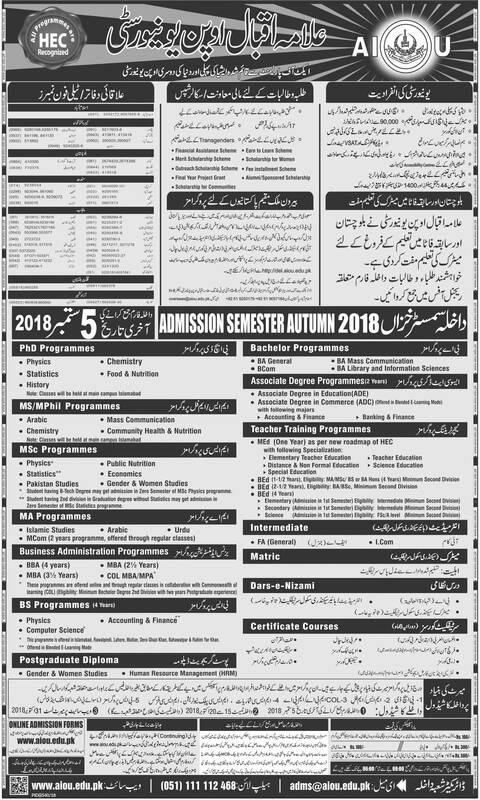 Allama iqbal open university Islamabad admission 2019 are now open with last date of 5th September. Here you can get complete details about aiou admission autum 2019 form download online, how to submit fee and aiou ba subjecs code list. Webstudy.pk will provide you with all the information about AIOU admission aut admission 2019 last date. You can download admission form Download online for fresh and continue students from official website of allam iqbal open university. If you wants to get admission then you should read all the article carefully because in this aritcal we have discuss the detail of admission procedure, documents required and eligibility criteria for fa, ba, ma and all the subjects. Allama iqbal open university was established in Zulfiqar ali bhutto’s government and this is the aisa’s first open university that provides distanace learning opportunity to the students who are unable to attend the classes regularly. Students can get the books and get study any time from the tutors of aiou. Since its name was Peoples open university but later on it was changed to Allama Iqbal Open university. Institute offers admission twice a year in semester system. There are two semester spring and autumn. Spring admission opens in march-april and autumn admission aiou open in September. This year aiou admission 2019 was open in same month in which millions of students apply and got admission. Allama Iqbal open university provide quality education to the students because it is the fourth biggest institute in the world in which 1121038 students enrolled and 3305948 courses are enrolled. AIOU a public research university was established in 1972 by peoples party of Pakistan. It offers admission in martic, intermediate, bachelors, graduate, undergraduate, post-graduate, mphil and phd programs. 05 september 2019 is last date to apply for admission. Allama iqbal open university is promoting education in Pakistan through its sub campuses in all over the Pakistan. These sub-campus have all the basic facilities like transportation, hostel, library, cafeteria, play grounds, well trained staff and highly educated faculty. Sub campus details are as follows. Students get education in less fee and with better facilities. University also provide free education to the poor students and also to the prisons. Main purpose of this university is to promot education in Pakistan and make affordable for each student. There is world class library in university from where students can get educational assistance. Play grounds, canteen, highly qualified staff is there for students. AIOU admission 2019 Last Date complete process is given below. It have different campuses in various cities in which This university, complete admission, test, result and examination procedure. Name : Allama Iqbal Open University (AIOU). You can download a admission form online from the official website or you can get a prospectus from your nearest book store. Fill the form carefully because incomplete or false information may lead you to cancel the admission. Choose you program and courses. Put your course code very carefully and submit the admission fee to the selected bank branches. Then attach all the needed documents along with the admission form and send it to the admission office aiou. Must attach the bank challan copy with application form and all the documents should be attested. Your admission form should reach the admission office within the due date. Note that all this information related to aiou admission 2019 is collected from different online sources but for authentic news & updates regarding allama iqbal open university aiou autum admission 2019 visit official website. Get latest updates and information about AIOU SSC, HSSC, BA/BSc, MA/MSc, BS, MS, B.Ed, M.Ed, B.Com, M.Com, BCS, MCS, BBA, MBA, MPhil and PhD programs admission 2019 from here webstudy.pk.